Collaborators: Keith Turner (Learnexx 3D), Prof Peter McOwan (QMUL). The virtual science lab is an interactive virtual environment that helps young people learn lab skills and understand research-led topics in bioengineering. The latest games technology is used to teach techniques enabling hands-on investigative experiments with real data. The Learnexx 3D platform also integrates teaching mechanisms (eg. feedback, assessment, peer-review) to encourage problem-solving and critical analysis. This combined approach to traditional learning platforms encourages students to become independent, deep learners with good practical and transferable skills. We observed improved examination marks ranging from 55-85% (2012-13) compared to 35-78% (2010-11) across multiple disciplines. Excellent scores from SEMS evaluation reports (4.3/5). A reduction in “real” lab time from fifteen to six hours per week giving more time to focus on data presentation and problem solving. There were significant improvements in efficiencies of space, costs, time and equipment utilisation. Student recruitment for the module was increased by 50%. and the site was “very informative and explained concepts in a clear, illustrated fashion. It is amusing and you feel like you want to learn more about topics”. Watch the virtual lab in action. Here is an example of a method typical in cell culture. 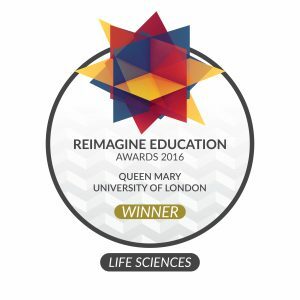 The Learnexx 3D platform will be explored college-wide and has been adopted by UCL, Open University and more recently by the Department of Biomedical Eengineering at the Technical University of Eindhoven. The virtual lab models equipment and tools that exist in the real world (eg. BMG, Eppendorf, Ocean Optics). The virtual lab mimics the research facilities at the Institute of Bioengineering, School of Engineering and Material Science, Queen Mary University of London. 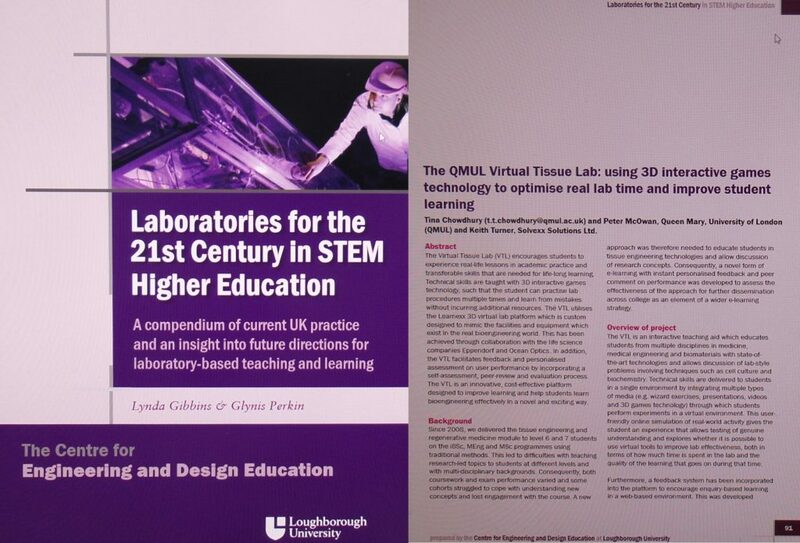 We are exploring the virtual lab as a Health & Safety training tool for research staff and students. The virtual science lab improved examination marks for students from several programmes in bioengineering, materials and medicine. This video gives a summary of the lab’s capabilities and types of equipment. The virtual science lab was funded by the Student Experience Investment Fund (2011-13), Westfield Trust (2013-15) and Impact Accelerator programme (2014-15). Tina is PI for these grants totalling £110K.